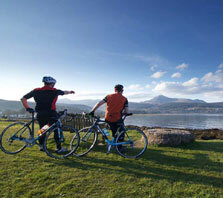 Our selection of Road and Mountain Bike Adventures in Scotland feature majestic scenery and varied pace. From an easy cruise through the Outer Hebrides islands to mellow tours through the UK’s largest National Park to our classic Coast to Coast trip, there is a trip for every level of cyclist. Scotland has twice been named the best place in the world to mountain bike. Our range of mountain bike holidays take you off the beaten paths and onto trails less taken! From mellow tours through the UK’s largest National Park to our iconic Coast to Coast trip, we have a trip for every level of rider. Along the way, you’ll stay in carefully selected guest houses and small hotels, so you can ride during the day and relax in the evenings. All of our trips in Scotland are led by experienced and qualified guides. With years of experience, they also know the back country trails in Scotland better than anyone. Throughout the day, our support vehicle will always be close to hand to provide drinks, snacks and a friendly ride should you need it. Many of our trips are point to point rides ~ our support vehicle transfers your luggage and offers a lift if you legs are tiring! 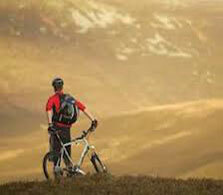 Did you know that Scotland is considered to be one of the best place in Europe to mountain bike. We offer premier mountain biking holidays in Scotland with the opportunity to bike superb trails through some of the most unspoilt scenery in Europe. Our hand picked selection of mountain bike trails will take you off the beaten track and onto the trails less travelled! Our road cycling holidays in Scotland feature spectacular scenery and some of the most interesting places you will find in Europe. Ranging from easy rides through the Outer Hebrides islands to a challenging week of riding the highest mountain roads in the UK., our trips are led by a qualified and experienced guide but you also receive detailed route notes for each day’s ride.